The Fontaine du Palmier is one of the historical fountains in Paris that is located at the Place du Chatelet, and is referred to as many different names, yet has become a famous landmark that is now also classified as an historical monument in Paris. Providing fresh drinking water for locals in the city of Paris had been an issue for a long time and many fountains were constructed to aid the needs of the poorer Parisiens that lived and worked in the capital. And so, even when it came to the start of the 1800s during the reign of Napoleon Bonaparte I, he also commissioned the construction of different water fountains that would provide fresh drinking water to the locals in different areas of the cityalong with some more elaborate ones that were designed more for pleasure. However, it was Napoleon Bonaparte that ordered the construction of systems such as the Canal d’Ourcq, which was designed to bring additional water into the city of Paris, and hence why monumental fountains were envisioned and also produced during the reign of the emperor. Now one of these particular fountains in Paris was called the Fontaine du Palmier, however it is often referred to as the Fontaine du Chatalet due to the fact that it is located within the Place du Chatelet, and this monumental fountain was constructed between the years 1806 through to 1808. Yet we said that there were several fountains constructed during the First Empire, and unfortunately some of these are not able to be seen in Paris today, just like the Fontaine Desaix, which was moved to the city of Riom, but some have also been moved to different locations in the city from their original positions. 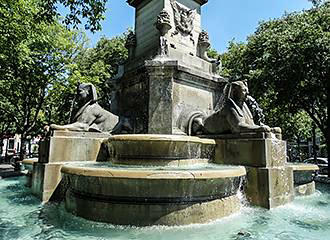 The Fontaine du Plamier is sometimes known as the Fontaine de la Victoire or the Fontaine du Chatelet due to where it is located on the Place du Chatelet, and as we have mentioned before, it is a monumental fountain in Paris that was constructed on the orders of Napoleon Bonaparte I. This monumental fountain was designed by Francois Jean Bralle, who was at the time the chief engineer overseeing the construction of these within the City of Paris, and it was constructed between the years 1806 and 1808. You will discover that it is a tall column reaching almost 22 metres in height, which was modelled after Roman triumphal columns, and on its barrel there are bronze bands with inscriptions that pay tribute to the victories of Napoleon including the Battle of Ulm in Austria and the Battle of Lodi in Italy. Around the base of the Fontaine du Palmier, which translates to Fountain of the Palm in English, you will see there are four statues and these allegories represent Vigilance, Justice, Strength and Prudence, which were produced by the French artist Louis Simon Boizot. 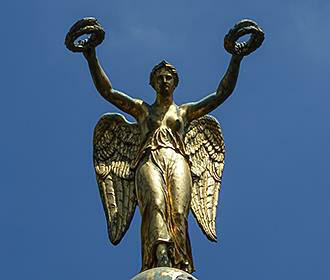 And it was the same sculptor who designed the gilded bronze statue of a woman carrying laurels of victory, hence it is known as a victory statue in Paris. But what you can see today is actually an exact copy of the original, as the original by Boizot is now held within the Musee Carnavalet, which is the museum that covers the history of Paris. However, not everything stayed the same, as the city of Paris was changing quite dramatically with the improvements that were being executed by Baron Haussmann during the 1850s, and the Fontaine du Palmier had to be moved. 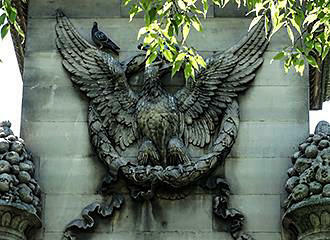 It was at this time that a lower base was added to the found in 1858, which was designed by Gabriel Davioud, who also designed monuments such as the Fontaine Saint Michel and the Theatre de la Ville. 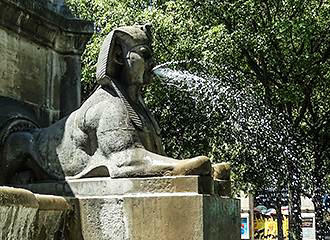 And it was decorated with statues of Egyptian sphinxes to spout streams of water, that were produced by the sculptor Henri Alfred Jacquemart, and so it became more monumental rather than just for supplying drinking water to the city. The Fontaine du Palmier is located in the 1st Arrondissement situated within the Place du Chatelet, which is one of the squares in Paris where you will also find the Theatre de la Ville and the Theatre du Chatelet. 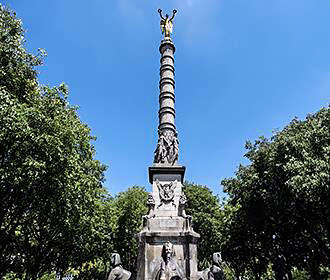 This monument is also located close to places such as the Tour Saint-Jacques and the Hotel de Ville City Hall, plus the River Seine and many other tourist attractions are within walking distance. When it comes to reaching the Fontaine du Palmier via the public transport system in Paris, you will find that the Metro station called the Chatelet stop is right there and can be accessed via lines 1, 4, 7, 11 and 14, yet if you are utilising the RER trains, you would need the Chatelet - Les Halles stop. Yet if you do not mind a little bit of a walk, then the Batobus water bus has a dock close by, plus the bus tours in Paris will also get you near to the Palm Fountain.